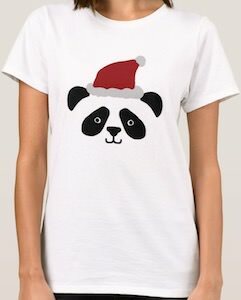 Be festive for the holidays all thanks to this fun Santa Claus Panda Bear T-Shirt. You can get this festive panda t-shirt in styles for men, women, and kids and it comes in many sizes to be the perfect fit. On the white Christmas t-shirt you can see the head of a panda bear and it looks like it is part of the shirt because the panda has white parts which blend into the background of the t-shirt. And to make it clear that it is Christmas the Panda is wearing the head of Santa and that makes this a Santa Claus panda bear and that is just funny. If you like to make sure people know that Christmas is coming then you just have to wear this Christmas Loading T-Shirt. The holiday t-shirt is available in styles for men, women, and kids and it comes in a many colors and sizes. 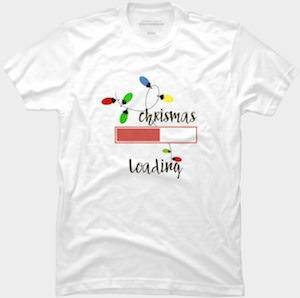 On the t-shirt you can see a loading bar and the text “Christmas Loading” and around the words you can find a string of holiday lights in many colors. 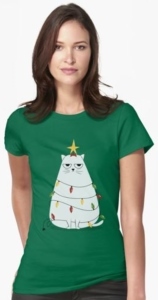 It is a fun t-shirt that you can wear all year long except on Christmas because then it should have stopped loading. Make sure people are aware that the holiday’s are coming so wear this t-shirt. Get ready for the holidays by wearing this Merry Christmas Wreath T-Shirt. The t-shirt is available in a bunch of colors and women’s styles and sizes. 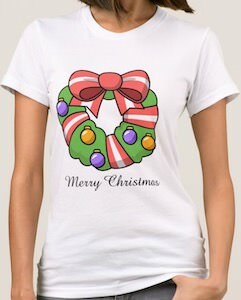 On the holiday t-shirt you can find a nice bright and festive wreath with a big red bow on top. Below the Christmas wreath it even says “Merry Christmas” so that everyone you meet will get the message of Christmas without you having to say it to everyone and accidentally forgetting someone. So now simply wearing this t-shirt will bring the spirit of the Christmas holiday and it will make people smile when they see you in this festive shirt. With the holiday season of Christmas upon us it is time to bake all those goodies and watch all your favorite Christmas movies, of course you should do all of this in a fun Just Bake And Watch Christmas Movies T-Shirt. 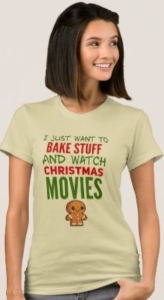 On the front of this t-shirt you will see the fun saying of ” I just want to bake stuff and watch Christmas movies ” done in a print of red and green for the Christmas season. Below this saying you will find a very cute gingerbread man with big friendly eyes and a huge happy smile. Available in a wide selection of women’s sizes that will range from Small to XL and choose from a huge array of shirt colors to get this fun Christmas saying on. With the holiday season of Christmas upon us why not mash up your some of your favorites like Santa, merlot wine and a merry cheer. 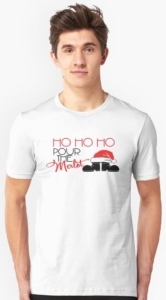 On the fron of this t-shirt you will find a funny saying appropriate for the Holiday season of Christmas. Find the saying ” Ho Ho Ho Pour The Merlot ” in a nice print along with Santa boots and a hat, perhaps Santa had too much wine. This is a slim fitted unisex t-shirt that is available in a wide selection of sizes that range from Small to 3XL. Choose from a huge array of fun vibrants colors, 18 total colors to choose from. The classic Super Mario probably loves the holidays so for Christmas how will he decorate his tree, with the Mushroom Kingdom and a star I think. 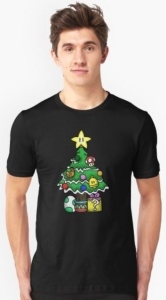 On the front of this t-shirt you will find Christmas tree that looks like it belongs in the popular Nintendo video game Super Mario. This tree is decorated in all things from the mushroom kingdom, from red and green mushrooms to a bright star on top. This is a unisex t-shirt that will fit men and women snug to the body. It is available in a huge selection of sizes that will range from Small to 3XL and choose from 18 different colors each vibrant and fun. Gingerbread man is supposed to be a fun loving cookie for Christmas, but did you ever stop to think about his feelings. With one bite the gingerbread man may hate Christmas. On the front of this t-shirt you will find a gingerbread man decorated with icing and has a very sad face because of a bite out of his head. Beside the gingerbread man is a saying of ” I Hate Christmas ” which is very sad but true for this cookie. You can get this Christmas gingerbread t-shirt in a wide range of unisex sizes from Small to 3XL and choose from 18 different shirt colors. 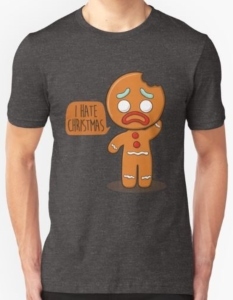 Make the Gingerbread man I Hate Christmas t-shirt your go to shirt for the holidays. 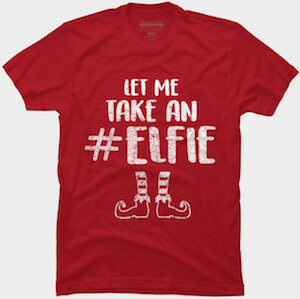 If you like a fun holiday t-shirt then come and get your Let Me Take An Elfie T-Shirt. The t-shirt is available for both men and women and comes in a bunch of colors and in sizes Small – 5XL. And if you like a Christmas sweater instead of a t-shirt then you are in luck as you can get that too. On the t-shirt it shows in a white print that reminds me of chalk and that says “Let Me Take An #Elfie” and below the text it shows the legs and shoes of an elf. Get ready for the holidays and taking a selfie by wearing this t-shirt. Dinosaurs are always fun to wear on your t-shirt but how about dinosaurs in ugly Christmas sweaters, now that is a great idea. 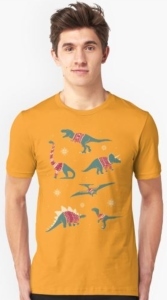 On the front of this t-shirt you will see 6 different dinosaurs, T-Rex, Stegosaurus, Brontosaurus, Triceratops, Tetradactyl and Velociraptor each dinosaur has a red and white ugly Christmas sweater on with some white snowflakes around them. This t-shirt is available in a huge selection of unisex sizes that range from Small to 3XL and you get to choose from 18 different vibrant, fun and unique colors. The shirt is a slim fitted shirt that will hug the bodies curves and be super comfortable while very durable to last you a long time and many Christmas holiday seasons.